After a solid junior campaign, 2018 West Valley (Yakima, Wa.) QB Brandon Battle is hoping that college coaches start to take notice of what he has to offer. 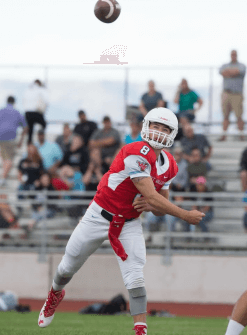 While helping to lead his team to a 5-5 record, Battle finished the season 204 of 329 (62%) for 2,871 yards with 27 touchdowns and 14 interceptions while also rushing for 209 yards and five touchdowns. “I’d call myself a dual-threat guy,” Battle said when asked to describe his game. “I have good pocket-presence and I have the ability to escape pressure with my legs and hurt defenses with my legs if things break down. “Most of my runs came off of scrambles, but we do have some read-option in our offense, so I did have some chances to run the ball that way too. As far as things that he wants to work on, Battle had a handful of things on his itinerary. Battle attended several camps last spring and summer and he said he’s planning to hit the camp circuit again this offseason as well. At a solidly built 6’0″, 200 pounds, Battle is an intriguing dual-threat prospect who put up some hefty numbers a junior this fall. We’ll keep tabs on the talented signal-caller over the next 15 months and we will update news on him as it happens.